Look around your nonprofit organization and decide how many volunteers you need and what functions they ca perform. We recommend creating a schedule of tasks to be completed – planning what needs to be done and how many people it will take to do the work. Below is a list of the kinds of volunteer assignments you might consider. Volunteers perform better if they know what they’re supposed to do. Preparing job descriptions for volunteer positions helps you to supervise better and to know what skills you are looking for in volunteers. This “Nonprofit Sample Template” is a valuable resource for all Nonprofit Organizations who desire to use effective tools that will undoubtedly help them acquire funding and provide quality services for their target markets. 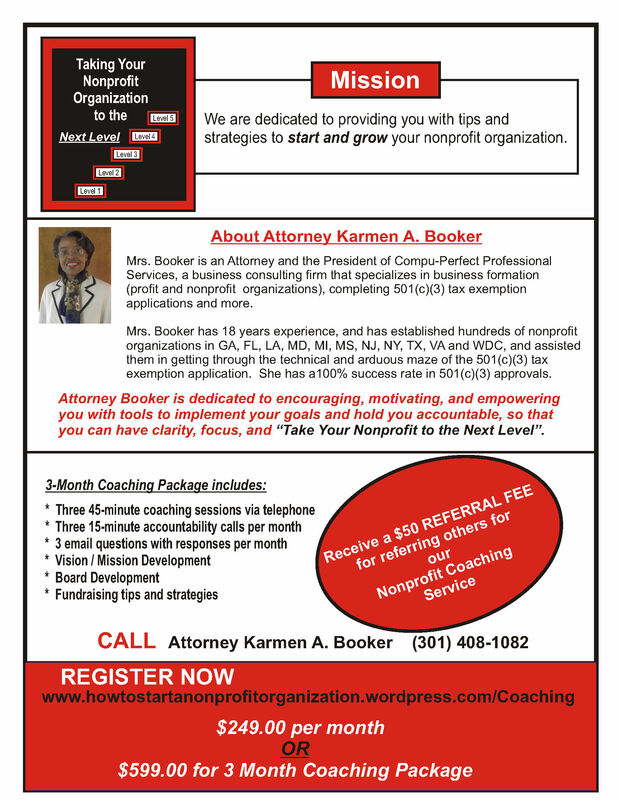 JOIN Attorney Karmen A. Booker to discover key factors for building and developing a Nonprofit Organization by registering for her monthly individual coaching program OR 3-month Group Coaching Package. This is a GREAT OPPORTUNITY to learn what it takes to establish a nonprofit organization, maintain an existing nonprofit organization and Take it to the Next Level, so you can help transform the lives of others (men, women, youth, and children) through your nonprofit programs and services. Please know that allotted spaces for the Coaching Session is extremely limited in that there are only 50 spaces available for the 3-month Group Coaching Session. As you can imagine, allotted spaces will fill very quickly, so you’ll want to act now. Peer Influence. Having friends who volunteer regularly is the primary reason young people get involved. According to a survey, the influence of friends increases with age — college students were most influenced by friends volunteering, while high school students were more influenced by parents. The road to volunteering is often a nontraditional one. Many of those surveyed found their volunteer opportunities through their religious groups, clubs, friends, or just independently. Religious youth groups are especially influential when it comes to young volunteers. Extracurricular activities such as sports and music also result in high levels of volunteering. Teens love to socialize, and want their volunteering to be more like a party with friends. The survey found that young people who go to movies and the mall frequently also volunteer more. Short activities that allow a range of engagement. Accessibility is key. For instance, the study suggests that needing a car to get to a volunteer opportunity could be a major drawback. Also, lack of time is the biggest impediment to volunteering for young people. Young people are very successful at fundraising. Peer-to-peer fundraising is the most common form of activity for young volunteers, with 38% participating. Such activities take advantage of their strengths — social networking and facility with technology. Young people who text often via mobile phones volunteered more than non-texters or those without mobile phones. Technology seems to encourage socialization, which then leads to more volunteering. Young people who volunteer are happier. They scored 24% higher on a life satisfaction scale. Make it easy for young people to raise money through their peer networks; make volunteering fun and social; recruit young volunteers through their existing relationships; and offer short volunteer opportunities that run the gamut from lightly involved to more serious engagement. Young people seem to self-organize and follow their peers. You’ll need to have a separate, nontraditional program to find young volunteers and get them involved. Go where these young people are – their extracurricular activities, sports activities, special interest groups.